In just a couple of weeks, I will be heading to the beautiful Caribbean island of St John for a family vacation. Like always, I plan to squeeze in as much birding as possible and I have bought some field guides to the region to prepare for the trip. Over two-thirds of the island is a U.S. National Park and I can't wait to explore it! 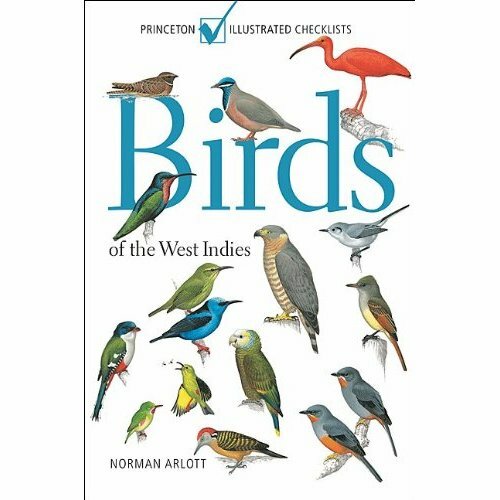 The two books that I bought are Birds of the West Indies (Princeton Illustrated Checklists) and Birds of the West Indies (Princeton Field Guides). Since they are both published by Princeton University Press and their titles are pretty much the same, I was half expecting that the books would be nearly identical. Luckily I was wrong and they both offer some features that the other book does not. This book is the most up-to-date field guide to the West Indies that I could find. 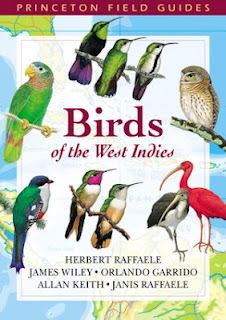 It was published in 2010 and thus has the best information on the distribution of birds on the islands that make up the West Indies. One area where I felt that this field guide was lacking was in the introduction. The introduction covers what I would consider the typical field guide introduction information, a map of the area the guide covers and a short explanation of it, pictures of bird topography, and a short section on what is included in the text to help with identification. Pretty standard stuff and there is nothing necessarily wrong with it but the other field guide just offers readers much more (more on that later). Once I got into the heart of this book, the first thing I noticed was the fantastic illustrations. They are extremely detailed, have very vivid colors, and I believe they will be a great resource in the field. I should note that no juvenile plumages are shown as a way to save space. The text that accompanies the illustrations is short but concise. It offers good descriptions of behavior, habitat and distribution but lets the illustration show the field marks rather than explaining them to you which I appreciate. The biggest complaint I have about this guide is that the species range maps are located in the back of the book not with the species illustration and description. This drives me crazy in any field guide and is especially challenging when the there are many islands and I would like to see if the species will be on an island I will be visiting. Overall, this is a fantastic field guide that has complete coverage of the West Indies. It has been an invaluable resource for my preparation for my trip. This field guide was published back in 2003 so it is a little older than the book by Arlott but the information does not seem to be dated at all. Raffaele offers one of the best introductions to a field guide that I have seen in a long time. He not only covers the typical information featured in a field guide introduction, but also includes a section on endangered species of the islands and the islands' conservation issues. The illustrations in this guide are extremely well done but on average, they do not show the vivid colors of many of the species quite as well as the guide by Arlott. There are a couple of notable exceptions. This field guide offers much better illustrations of both parrots and hummingbirds. Also, since this book is slightly larger, I do not feel that the illustrations are quite as crowded. the larger size also allowed more juvenile plumages to be included. This book also addresses the major complaint I had with the other field guide. All of the range maps area included next to the text discussing each species. This allows me to quickly recognize if the species will be present on the island that I am visiting. I feel that this too is a must have guide for the region. I always like to have multiple field guides with me when visiting new locations and I can't wait to test these two out in the field!